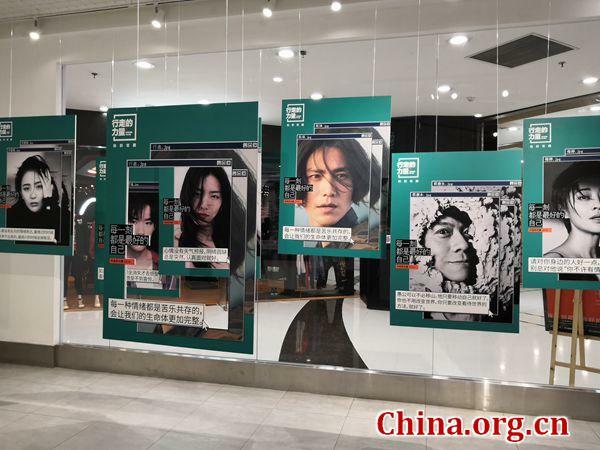 Tucked away on the second floor of a busy shopping mall, a large image of Chen Kun's face draws passersby to pause and take a look. Those who enter discover a quiet space for reflection and may discover a new way of exploring nature – the outdoors as well as the nature of the human spirit. Visitors to the "Power to Go 2018 Exhibition," on display now through Jan. 27 at Joy City, walk through eight rooms showcasing multimedia materials related to the Power to Go 2018 program. The opening hall introduces the Power to Go program and the eight journeys that have taken place since 2011, when it was first launched by celebrity actor Chen Kun. Each year a group of selected participants from different careers hike together for several days in remote destinations including Tibet, Qinghai and the Himalaya mountains, to name a few. Each year, 12 to 20 applicants between the ages of 18 and 45 are selected through a rigorous audition process that includes emotional questionnaires, interviews and short video submissions. The promotional office reports that in the program's eight years, nearly 3 million people from around China have applied. The trips are funded by endorsements from corporate sponsors such as Fila and Canon, who pay for clothing, outdoor gear, transportation and accommodation, as well as for the promotional materials, including this exhibit, that are intended to raise awareness and spread the program's message encouraging people to get out and walk as a way of connecting with their spiritual lives. Participants have ranged from university students and teachers escaping the "ivory tower" to entrepreneurs, volunteers and actors seeking inner peace. The 2018 trip to Yunnan province, with the motto "Each moment is the best version of yourself," selected 20 participants with backgrounds in psychology, all with a stated desire to explore emotions from different perspectives and share them with others. One exhibit displays excerpts of trip diaries from the 2018 trek, along with meaningful artifacts that capture moments of reflection along the trail. Chen Qingrong, a 40-year-old acupuncturist and mother of two, wrote that we cover up our true feelings as we grow up. She wrote that she was deeply inspired by Chen Kun's words: "But now we need to awaken them. We may need our entire lives to do this. But when we are confident in them, our lives may be fulfilled." Another 2018 participant, 29-year-old curricular designer Liu Cheng, wrote in her diary, "We need to be more honest, more courageous. We need to follow our own pace in life, not to follow suit. And we need to work hard to practice more and speak less, so that we won't regret what we are doing." Team leader Charles Wu has been with the program since its inception in 2011. He is responsible for route planning and safety. He said the goal during the trek is to walk in silence. Though it's not a strict requirement, they try not to talk unless necessary. "That way you're communicating with yourself," he said. During the 2018 journey, ten media generated public interest by producing eight short films documenting the team's progress as they trekked through Yunnan province, which were released through online channels. According to the Power to Go promotional office, the exhibition attracted 25,879 visitors in the first 120 hours after opening. Some, like Beijing-based hobby painter Li Han, found out about the exhibit via Weibo. "I'm a fan of Chen Kun," said Li, who follows his official account. "I admire his efforts to push the program forward for eight consecutive years." Another visitor, Lara Khil from Ukraine, discovered the exhibition by chance while shopping in Joy City. She said the subject immediately reminded her of the words of her friends who said "Life is better in hiking shoes." Being an actress herself, Khil was especially intrigued by one exhibit hall containing black-and-white portraits of men's faces with mirrors on the opposite wall. "It was interesting to figure out how these men were feeling, and then with the mirror, to try to display the same emotion," she said. The exhibit pairs photographs taken along the journey with pieces that explore the way people name, define, and express emotions. A large video installation room includes projections of text about emotions borrowed from "The Book of Human Emotions" by Tiffany Watt Smith, which tells the story of 154 different emotions from around the world. Also projected on the screens are comments from people shared via Weibo or placed in the "emotion box" near the end of the exhibit. The statements are updated weekly, said Wu, to reflect the most current genuine responses to the exhibit's themes. Wu explained that as he sees it, Chinese culture has a somewhat negative view of being "emotional." He said, "Emotions are based in culture, built up from culture. We're trying to do this from a Chinese perspective of emotions. It breaks down barriers to give that feeling that you have a name." The final room of the exhibition displays 63 different emoticons on cloud-shaped boards that hang from the ceiling, interspersed with quotes by famous Chinese and foreign philosophers and writers from Arthur Schopenhauer to Wang Xiaobo. Chen Kun is famous in China not only as an actor on the big screen, but also as a singer and published writer. Chen is also a UNICEF ambassador for China, and was the second male celebrity to appear in the Madam Tussaud's wax museum in Shanghai. Though initially, said Wu, some people perhaps wondered if Chen's decision to launch the program was a fluke, after eight years it has become clear that "it's more than a publicity stunt." And after eight years, Wu said, "It's everything to me now. I wouldn't choose to do anything else." Speaking of the program's impact and future potential, he added, "I know it's helped people. It's helped me, it's helped my family, my friends, so I know the path we're on is right." A photography and multimedia exhibit on display at Chaoyang Joy City documents hikers' exploration of physical and emotional landscapes.